Adopted on July 15, 1994. The controversy over Kentucky's state tree brewed for more than 40 years before being decided in 1994, with the selection of the Yellow Poplar, (Magnoliaceae Liriodendron tulipifera,) a.k.a. Tulip Tree or Tulip Poplar on July 15, 1994 as Kentucky official state tree. As sales of coffee tree seedlings, plants, paintings, prints and all sorts of related trinkets increased, legislation supporting the coffee tree surfaced. The arguments went back and forth for two years until, finally, on March 8, 1976, Senate Bill No. 150 was approved and the Kentucky coffee tree was " named and designated as the Kentucky state tree." It only took a little over ten years before the issue of a state tree was put before the Kentucky Legislature again. The tulip poplar proponents were back introducing several bills before 1994 to no avail. However, by 1994, the tulip poplar lobby had their act together. In 1994, State Representative Bentley introduced House Bill No. 128 to dethrone the Kentucky coffee tree and crown the tulip poplar as the state tree. The Kentucky coffee tree didn't get the backing it needed and House Bill No. 128 was approved in both the Kentucky House of Representatives and in the Kentucky Senate. It was signed by the leaders of both houses on February 25, 1994 and forwarded to Governor Brereton C. Jones for his approval. On March 9, 1994 the tulip poplar was officially returned to its role as the Kentucky state tree without the Governor's signature. Liriodendron tulipifera - known as the tulip tree, American tulip tree, tuliptree, tulip poplar, whitewood, fiddle-tree, and yellow poplar - is the Western Hemisphere representative of the two-species genus Liriodendron, and the tallest eastern hardwood. It is native to eastern North America from Southern Ontario and Illinois eastward across southern New England and south to central Florida and Louisiana. It can grow to more than 50 m (165 feet) in virgin cove forests of the Appalachian Mountains, often with no limbs until it reaches 25-30 m (80-100 feet) in height, making it a very valuable timber tree. It is fast-growing, without the common problems of weak wood strength and short lifespan often seen in fast-growing species. April marks the start of the flowering period in the southern USA (except as noted below); trees at the northern limit of cultivation begin to flower in June. The flowers are pale green or yellow (rarely white), with an orange band on the tepals; they yield large quantities of nectar. 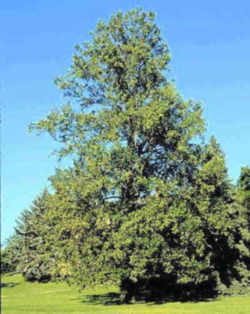 The tulip poplar is also referred to as yellow poplar, tuliptree, tulip-poplar, white-poplar, or whitewood. The flowers' petals fall shortly after blooming, leaving behind cone-shaped clusters of winged seeds that ripen in the fall and drift away. The seeds are eaten by various types of birds and small animals, but aren't great favorites of any, except possibly cardinals. 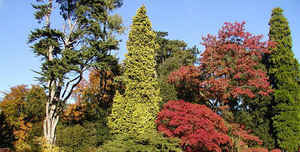 Once the seeds are blown away or devoured, the cones remain throughout the winter. Tulip Poplars are rapid-growing and long-lived. They grow straight and are tall, averaging about 100 feet. The tallest living Tulip Poplar, according to the National Register of Big Trees, is located in Bedford, Virginia at 111 feet high, with a trunk over 31 feet around. The trunks of the Tulip Poplar are stout with gray furrowed bark. A Tulip Poplar's age can be estimated from the density, darkness of color, and amount of furrows in the bark. The oldest living Tulip Poplar, located in New York, is approximately 225 years old. In Kentucky, the Tulip Poplar prefers the mountains of Eastern Kentucky. Tulip Poplars thrive in deep, moist soils along streams and in mountain coves. 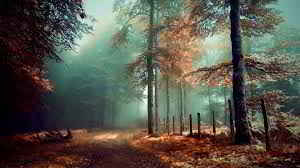 They need full sunlight to grow and develop; in dense woods, newly-germinated seedlings will survive only a few weeks. 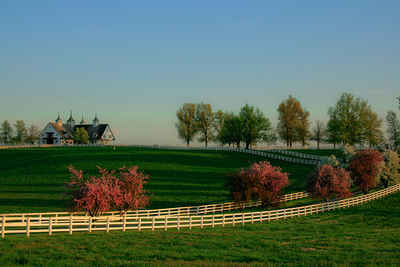 Instead, stands of Tulip Poplars are usually established in abandoned fields by wind-borne seeds. Yellow-poplar (Liriodendron tulipifera), also called tuliptree, tulip-poplar, white-poplar, and whitewood, is one of the most attractive and tallest of eastern hardwoods. It is fast growing and may reach 300 years of age on deep, rich, well-drained soils of forest coves and lower mountain slopes. The wood has high commercial value because of its versatility and as a substitute for increasingly scarce softwoods in furniture and framing construction. 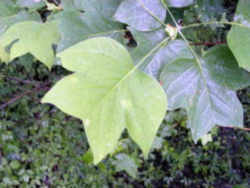 Yellow-poplar is also valued as a honey tree, a source of wildlife food, and a shade tree for large areas. Leaf: Alternate, simple, palmately veined, orbicular, 4-lobed with an entire margin, 4 to 8 inches long. Somewhat shaped like a tulip. Flower: Showy, but high in the tree, 2 1/2 inches long, with yellow-green petals and an orange corolla. Present April to June. Fruit: An oblong aggregate of samaras, deciduous at maturity. Each samara is 1-winged, 1 1/2 inches long, and 4-angled. Maturing August to October. Twig: Red-brown in color, often with a shiny appearance or a waxy bloom. Stipules are large and encircle the twig. Buds are elongated and valvate, resembling a "duck bill". Twigs have a sweet, spicy odor when broken. Bark: Light gray-green in color, often with white in grooves or in patches. Smooth when young, developing flat-topped ridges and furrows in diamond shaped patterns. On older trees sapsucker holes are common. Form: In a stand, this tree is very straight with a limb-free bowl. Open-grown trees have a pyramidal crown when young, becoming oval in shape. AN ACT relating to designation of the Kentucky coffee tree as the official tree of the Commonwealth. Section1. A NEW SECTION OF KRS CHAPTER 2 IS CREATED TO READ AS FOLLOWS: That the Kentucky coffee tree is named and designated as the Kentucky state tree. The law designating the tulip poplar as the official Kentucky state tree is found in the Kentucky Revised Statutes, Title 1 (SOVEREIGNTY AND JURISDICTION OF THE COMMONWEALTH) Chapter 2 (CITIZENSHIP, EMBLEMS, HOLIDAYS, AND TIME) Section 2.095. 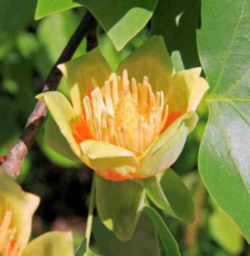 The tulip poplar is named and designated as the Kentucky state tree. History: Amended 1994 Ky. Acts ch. 40, sec. 1, effective July 15, 1994. 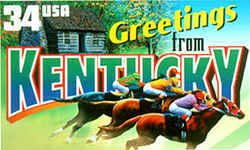 - Created 1976 Ky. Acts ch. 43, sec. 1, effective June 19, 1976.